I was abit lacking on motivation this morning, but downed my cup of coffee and headed out the door, $20 in hand to see what the morning had to offer. The 1st three and the last yard sale netted nada, but the other one, just off of Lonesome Rd, had a variety of craft items of interest. Total expenditures $3.25. 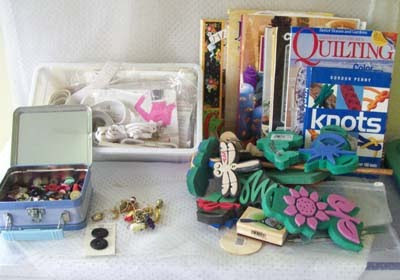 A variety of sewing items. The top of the box had (amazingly enough) shoulder pads, but down below were a variety of laces and rick rack ... good deal of 75 cents. A collection of buttons (not that I really needed more buttons, but what the heck).